The easiest way to add a notification feed to your site. Aggregation, real-time, follows, counts and react components enable you to build a highly relevant notification feed. 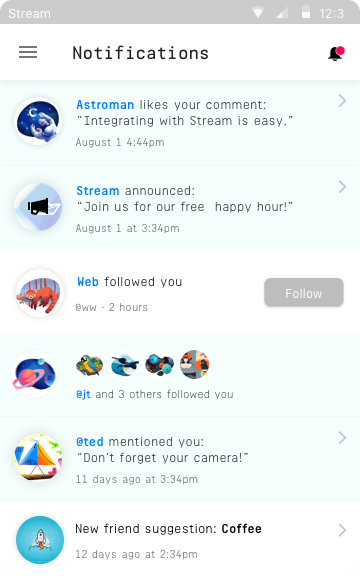 Follow topics or announcements to easily notify large groups at once. Grouping together common events on an activity is simple with aggregation. Display the count of the number of unseen or unread notifications. Receive notifications in realtime via Webhook / Webhook or SQS. In this code example we add a like activity to Josh’ notification feed. Note that you can add custom fields to the activity. Next we’ll read the feed. Note how the data is aggregated. By default the activities are aggregated by time and verb. You can change or disable aggregation logic in the dashboard. The response also includes the number of unseen and unread notifications.